"Reflections on Contemporary East African Art"
This unique print exchange was conceived by Alice Spencer, a founding member of Peregrine Press, after visiting Zanzibar in early 2010 and teaching the fundamentals of stenciling and block printing to 12 professional Muslim henna artists, all women. 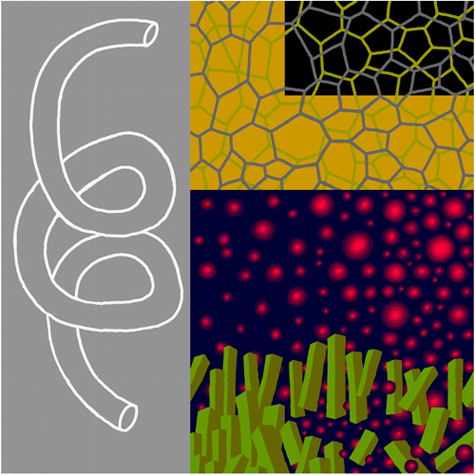 The two groups of artists then agreed to create individual editions of 10" x 10" base prints apiece and exchange them for distribution to a second artist in the other group. 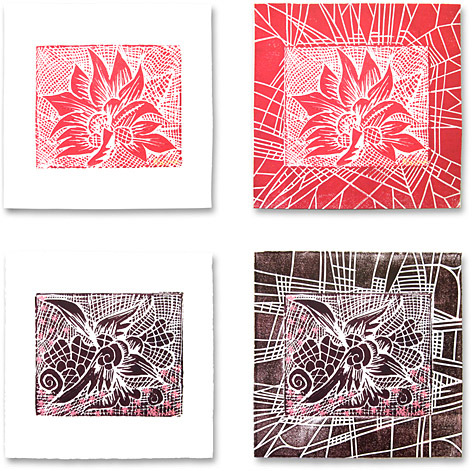 Responding intuitively and imaginatively to the base print as a background, the second artist then added another layer of gestures, imagery, or manipulations to finish the prints. 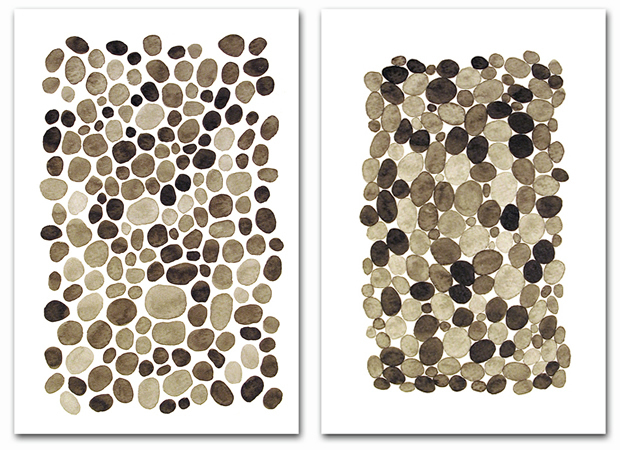 The two resulting matched sets of collaborative prints are unique, showcasing the deep similarities — and mysterious differences — between kindred spirits working "together" across a distance of 6,000 miles. The prints are being exhibited simultaneously at the Portland Public Library and in Stone Town, Zanzibar, from April 1 to May 28, 2011. 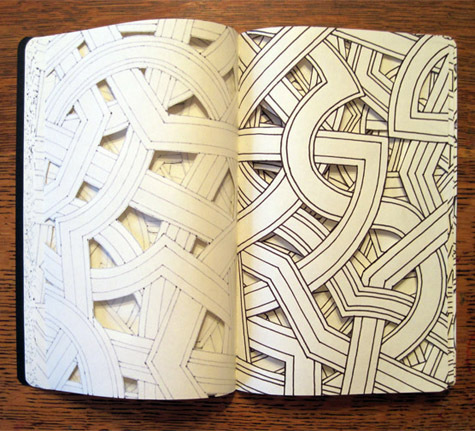 The Sketchbook Project unites almost 10,000 artists from over 60 countries with a simple call to action: fill a sketchbook and share it with the world. Now in its third year, the Project reflects the DIY ethos of Art House Co-op, a Brooklyn-based gallery dedicated to creating massive international art projects for everyone. Thousands of sketchbooks are being exhibited at galleries and museums as they make their way on tour across the country. After the tour, all sketchbooks will enter into the permanent collection of The Brooklyn Art Library, where they will be cataloged and available for the public to view. 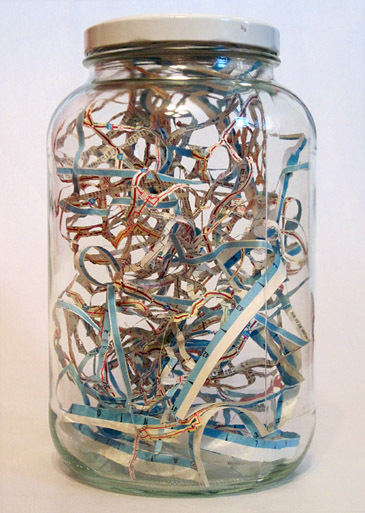 The Jar Project, an installation consisting of sixty art-filled jars made by sixty artists with connections to Maine, will be displayed as part of Product: A Temporal Artist Marketplace, at Whitney Art Works. The jars vary in size, color and texture, and contain a range of genres and media including drawings, paintings, photographs, sculptures, and mixed media. The brainchild of Portland-based artist Alex Sax, the Jar Project highlights the creative contributions of numerous local talents, fusing their individual creations together in an installation that is in equal parts evocative, nostalgic and strange. A selection of map-related art works by Shannon Rankin, Jeff Woodbury, Susan Prince Thompson and Irmari Nacht. "'MAPS,' a four-person show at June Fitzpatrick, doesn't shy away from "altered" art - it even soars on it. 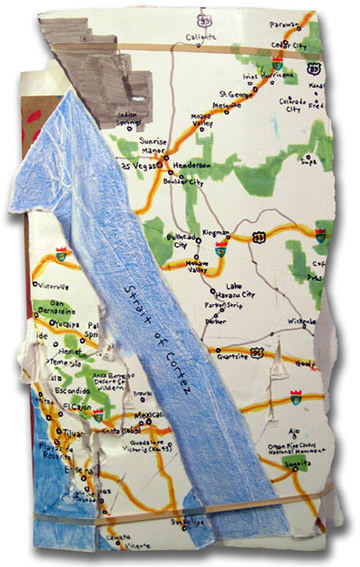 All four artists (Shannon Rankin, Irmari Nacht, Susan Prince Thompson, Jeff Woodbury) include altered books or maps in their work - usually with highly successful results." 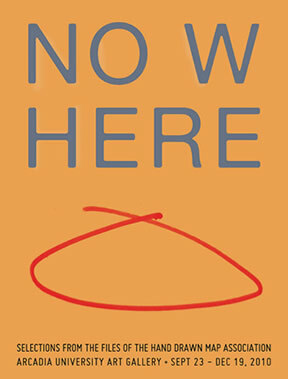 "Nowhere: selections from the files of the Hand Drawn Map Association includes over 60 examples of maps drawn by artists, cartographers and amateur map makers from around the world. Included in the exhibition are works from the archive of the HDMA as well as new works chosen expressly for this occasion. 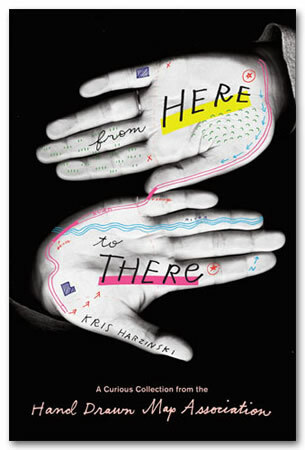 The exhibition, curated by Kris Harzinski, coincides with the release of From Here to There: A Curious Collection from the Hand Drawn Map Association published by Princeton Architectural Press." "It's a situation we are all acquainted with: planning to visit friends in an unfamiliar part of the city, you draw yourself a rudimentary map with detailed directions. In March 2008, graphic designer Kris Harzinski founded the Hand Drawn Map Association in order to collect just such drawings of the everyday. Fascinated by these accidental records of a moment in time, he soon amassed a wide variety of maps, ranging from simple directions to fictional maps, to maps of unusual places, including examples drawn by well-known historical figures such as Abraham Lincoln, Ernest Shackleton, and Alexander Calder." For more information visit the Princeton Architectural Press. 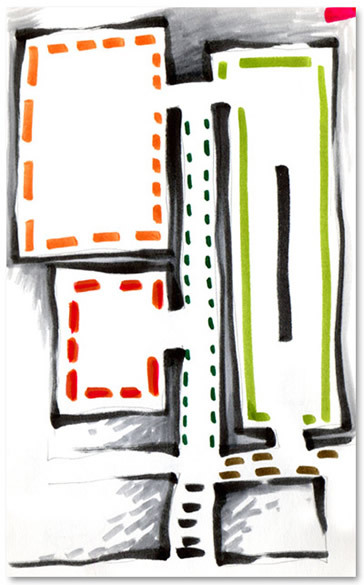 I'm pleased to have a selection of my hand-drawn maps, curated by Kris Harzinski, featured on the HDMA website. Kris does good work. Send him a map. Really. "The Hand Drawn Map Association relies on your contributions to keep our collection growing. We accept submissions via email, postal mail, and upload. Please choose whichever method is most convenient for you. 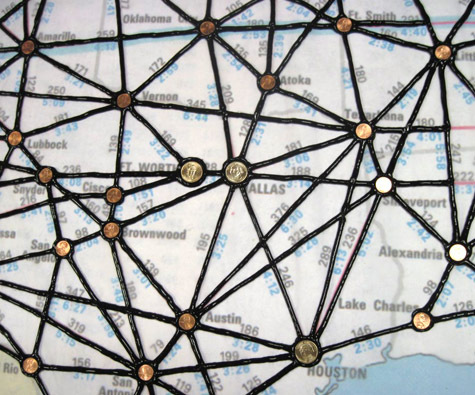 Our goal is to share the maps you have found or created with the widest audience possible." 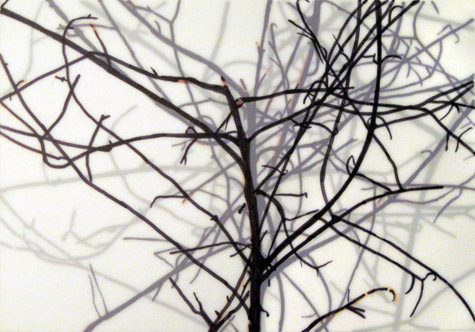 "Including work from his recent "branches" series, Jeff's drawings will bring our gallery to life in August. Working with a wide range of media and ideas, Jeff's work are beautiful abstractions anchored in nature and geography." I was delighted to display my work in this charming setting, and thoroughly enjoyed the energy and enthusiasm that greeted my printmaking workshop. Attending a showing of "A Town Called Panic," complete with waffles, only added to my infatuation. The town of Denmark lies at one end of Moose Pond; my favorite night-shredding mountain - Shawnee Peak - rises at the other. "Trashed seeks to answer the age-old question, what makes it art? We have reached out to artists across the United States and even up into Canada and found a collection of savvy painters, thinkers and craftsman who have happily handed over their trash to us, which we will be hanging on the walls, placing on the floors and leaning against furniture in our home. We can't afford a gallery space and if we could, then you probably couldn't afford the art. So please, before you arm yourself with your poison pen, remember we are doing this for the right reasons…oh, hell, whatever that means." "The exhibition presents a diverse group of work in a variety of media, all of which use mapping concepts to explore uncharted territories both formal and intellectual. 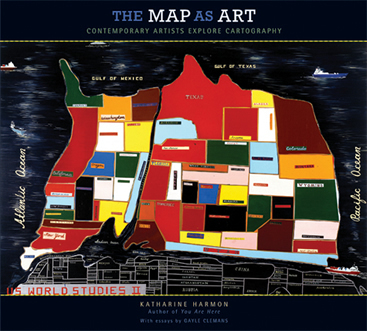 The show is presented concurrent with the launch of Harmon's book, The Map as Art: Contemporary Artists Explore Cartography (Princeton Architectural Press). The exhibition features works by: Doug Beube, Matthew Cusick, Joshua Dorman, Jerry Gretzinger, Ingo Gunther, Jane Hammond, Emma Johnson, Karey Kessler, Joyce Kozloff, Hayato Matsushita, Meridith McNeal, Florent Morellet, Vik Muniz, Aga Ousseinov, Matthew Picton, Karin Schaefer, Dannielle Tegeder, Heidi Whitman, and Jeff Woodbury." "Contemporary illustration in Maine and elsewhere: a survey of smallworks and what illustrators are picturing and drawing, imagining and designing." "Worm Hole Frothy Universe (a modular drawing in 25 parts)"
I'm pleased to have my work included in this wonderful new book by Katharine Harmon, author of "You Are Here: Personal Geographies and Other Maps of the Imagination." 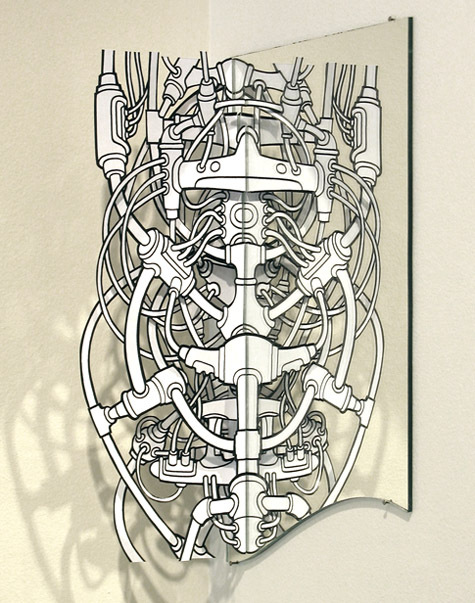 In this group exhibition I am showing two etchings and a serigraph from my dissected map works, three ink drawings from my Timeline series and one n-dimensional drawing from my Machinespine series. 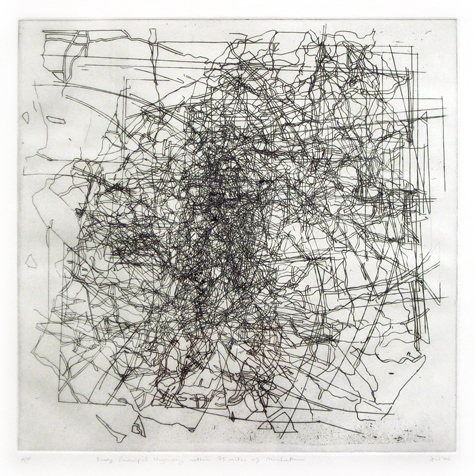 "Jeff Woodbury's etchings and a serigraph temper their abstraction by their lineage from California and Pennsylvania highway maps. Among them, 'Ghost State (Pennsylvania)' is an achievement of form and a little wonder of opacity. Read the wall text for his line drawings that comprise 'Time Line.'" Excerpted from the Maine Sunday Telegram review by Philip Isaacson: "Black & White exhibit at June Fitzpatrick Gallery"
I made a number of drawings on the theme of “gathering” for the third annual small works show put on by Alex Rhealt of drawing room in Portland. Here are two. Here’s the outline of the slide lecture I presented at SUNY New Paltz in November. “The Student Art Alliance Lecture Series was initiated and formalized about ten years ago. In the past decade, nearly 200 artists, designers, and critics have presented public lectures on their work or current issues in contemporary culture. The visiting artists and designers represent the range of disciplinary and interdisciplinary interests of the students and faculty members of the Art Department..."
Special thanks to Carmen Lizardo and Josh Kramb, good artists and wonderful friends, for their gracious hospitality. CMCA has held juried exhibitions since 1978, and this year's exhibition features 103 works by 89 artists. Juried by Carole Anne Meehan, curator at the Institute of Contemporary Art in Boston; Scott Peterman, Maine photographer; and Andrea Pollan, founder and director of Washington DC's Curator's Office. Abstract photography by Maine artists. 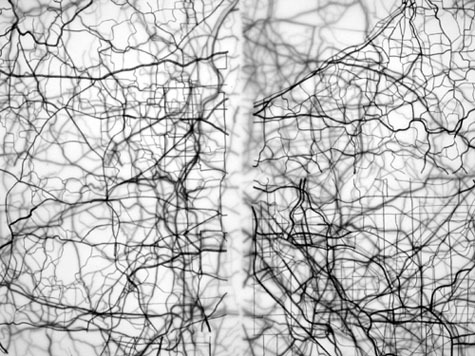 "The works by the twelve artists selected for the exhibition focus on abstraction in photography across a range of techniques and approaches, from traditional black and white printing to the most advanced digital media." 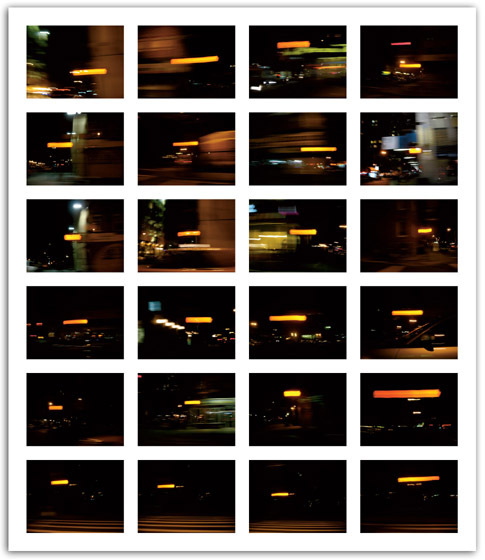 See an original print from my "CRRB" photo series, a video montage, and three images from my "firelite" body of work. Watch a Quicktime video of "CRRB"
(drawing on both sides of the brain)"
I drew this diagram of the brain with both hands at the same time, and showed it at drawing room in December 2007.
drawing room dedicates itself to drawing, as dialogue, practice, process, experience, medium, object, and idea. 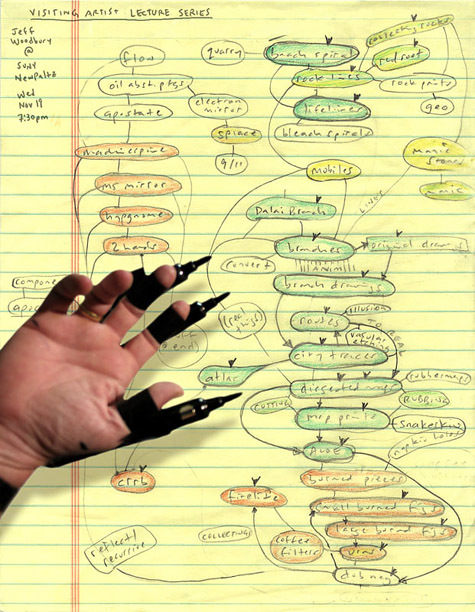 Drawing with both hands at the same time; Atlas, a work in progress; Maine dissected; folding actions into themselves. You can view a portfolio of my drawings at the June Fitzpatrick Gallery at 112 High Street in Portland, Maine (view map). This intimate townhouse gallery is situated across from the Portland Museum of Art's McLellan House. Other good stuff to see, too.